RUSH: Here is Indra Nooyi. She is the CEO of PepsiCo. PepsiCo owns Frito-Lay. I don’t know if they still own Pizza Hut or not, but I think they used to. But they’re a massive, what’s the term, multinational. And you have to spit multinational corporation, you have to spit that out. It’s a conglomerate. We hate these things. We’re supposed to hate these things. They’re destroying the planet, except they’re all big libs. And this babe is a lib too. She’s under fire for suggesting Doritos for women. There’s two things. Doritos, it’s said that women do not like the crunch when they’re eating these. It’s not so much they don’t like the crunch when you’re eating them, although that is irritating to women, particularly if it’s their husbands doing the eating, but they don’t like the crunch when they are eating them. And they also don’t like they got stuff on ’em. You gotta wash your hands after eating ’em. You know the way to eat Doritos? You chop ’em up and you put ’em in a coffee cup and you just sort of sip them. That way your hands never touch ’em. That’s the way to do it, that be the refined way to have Doritos. If you don’t want to get that stuff on your hands — women do not like licking their fingers in public. Now, that has ramifications beyond Doritos, but I’m not gonna go there. I’m gonna stick to Doritos and the fact that the crunch is not appreciated by women. And here’s what the PepsiCo CEO said. 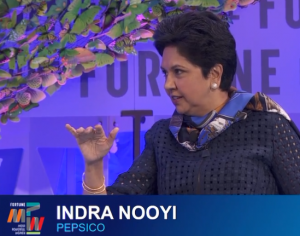 NOOYI: They don’t like to crunch too loudly in public, and, you know, they don’t lick their fingers generously and they don’t like to pour the little broken pieces and the favor into their mouth. It’s not a male and female as much as other snacks for women that can be designed and packaged differently. And, yes, we are looking at it, and we’re getting ready to launch a bunch of them soon. And how can you put it in your purse, because women love to carry a snack in their purse. So Doritos for the purse soon to be from PepsiCo. And I’m telling you what they’re gonna be. No, women won’t like this. You chop these things up, just smash ’em. So you got little bites. And then you rip open the top of the bag and just open it and pour the bag into your mouth when you want a mouthful of Doritos. But that wouldn’t look refined, either, would it? Did she say that, women do not like — (interruption) that’s right. No, no. They don’t like to pour the little broken pieces and flavor into their mouth. You’re right. I should have known. I’m a guy. I had an idea. It won’t work. But apparently she’s under fire for this because you’re no longer allowed to suggest out loud that men and women are different. She violated a central premise of the modern era of feminism, which is that men and women are not different, and certainly they’re not different in matters of snacking.